On April 1 2016, the entire studio was taken away secretly to a studio activity. We were launching our new branding, everyone knew that but no one had a clue where we were headed. Mostly parties, off-sites, resorts, lunches, beverages, hype and media are the way to go about it. But we chose an old age home. 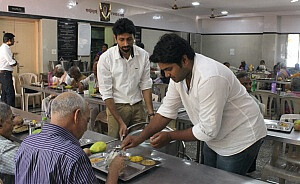 By actually meeting and serving food to the elderly we realised how fragile their lives were, how happy they seemed to meet strangers, how eagerly they enquired about our well being, how many interesting stories hid behind their wrinkled faces. We could have never even imagined all this sitting in our studio! Small joys over time are far valued than a single big one. 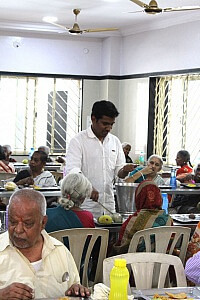 When we spoke to the elderly there (all aged above 60+) it was evident that they valued people who came met them regularly, they valued small talks over materialistic gifts, they valued playing games everyday over one outing to the movie or media, they appreciated hand cooked food over any tasty joint deliveries. As designers we tend to focus on lots of big things but seldom realise the small features, tiny increments, finer details done over time are far more effective. As designers it is very easy for us to be carried away into the future. At times we forget to see what is already available and how do we maximise it. It’s extremely easy to paint on a fresh canvas but it requires immense talent and skill to extend an existing piece of art. The experiences of these 70 odd people gave us insight onto how they maximised all the resources they ever had in their lives. 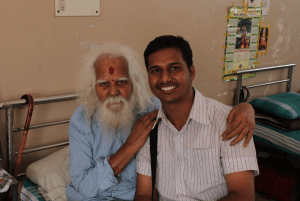 We met a director, a teacher, a homemaker, a businessman and so many more faces. Each and every person highlighted how grateful they were to life and its being. How they really went about their purpose, yet not expecting a lot from the world. While this comes quite naturally to designers we are often seen waiting for the right time or the right audience to express ourselves. 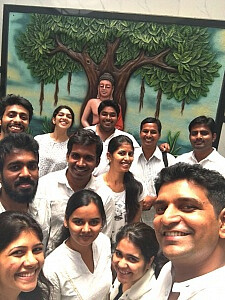 We met a gentleman who used to be a Kannada movie director in his prime and within seconds, he was brimming with ideas and self-expression. Another lady spoke about how her family does not take care of her but her friends here are so much more caring and lend an ear to her stories and thoughts. 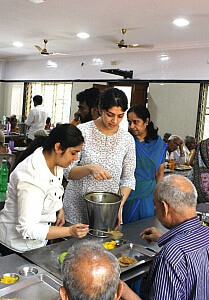 While we served food as well people asked for small portions or large portions of the serving without hesitating once. Not trying to look good, not trying to live up to any perceptions. I am sure a fully expressed designer is also a happy designer! Take your teams (design or otherwise) to places where empathy is real. It would not only connect them with each other better but really make them better designers and better human beings.